The Belvedere Formal Dining Room Group by Fine Furniture Design at Alison Craig Home Furnishings in the Naples, Fort Myers, Pelican Bay, Pine Ridge, Bonita Spring, Golden Gate, Estero, Cape Coral, Marco Island, Sanibel/Captiva Island, Point Charlotte, Ave Maria, Florida area. Product availability may vary. Contact us for the most current availability on this product. Drawer Suspension Crafted to Open Smoothly on Double Shoulder with Wood on Wood Glides. Drawer / Shelf Construction Framed and fit flush with case; constructed with half inch solid wood sides; joined with English dovetails on the front and back of drawer; assembled with glue blocks on underside; carefully sanded and finished on the inside. Finish & Paint Options Amalfi Finish is a deep, lustrous hand-rubbed patina on walnut solids. Sienna Finish is a combination of a darker hand rubbed black with custom hand stippled silver leaf on Cerejeira mahogany fancy face veneers. 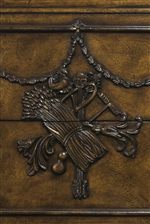 Pompeii Finish is an all over hand applied antiqued silver leaf with subtle texturing on figured cherry veneers. Finish Rich Dark Hand Rubbed Veneer on Walnut Solids. These unique pieces tell a story from earlier times, when furniture was hand made and built to last. 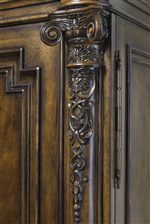 The furniture from the Belvedere collection invokes the designs of French and Spanish antiques from the nineteenth century and architecture and furniture from the heyday of ancient Greece. 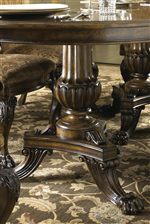 All pieces are hand carved from walnut solids, but figured cherry and select Cerejiera mahogany veneers are used on certain pieces. 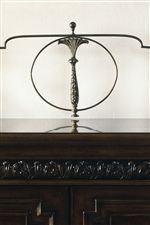 Three finishes are shown, but only on select pieces; Amalfi Finish, a deep, lustrous hand-rubbed patina on walnut solids; Sienna Finish, a combination of a darker hand rubbed black with custom hand stippled silver leaf; and Pompeii Finish which is an all over, hand applied, antiqued silver leaf with subtle texturing. Pieces are trimmed with brass colored hardware. This collection caters to the modern lifestyle with plenty of storage and customizable options, but appeals to traditional design sensibilities. The Belvedere collection is a great option if you are looking for Traditional furniture in the Naples, Fort Myers, Pelican Bay, Pine Ridge, Bonita Spring, Golden Gate, Estero, Cape Coral, Marco Island, Sanibel/Captiva Island, Point Charlotte, Ave Maria, Florida area. 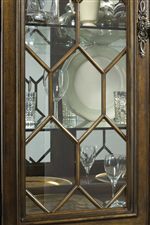 Browse other items in the Belvedere collection from Alison Craig Home Furnishings in the Naples, Fort Myers, Pelican Bay, Pine Ridge, Bonita Spring, Golden Gate, Estero, Cape Coral, Marco Island, Sanibel/Captiva Island, Point Charlotte, Ave Maria, Florida area.